The International Funboard Class Association (IFCA) and the European Freestyle Pro Tour (EFPT) once again team up to deliver a windsurf judging course. 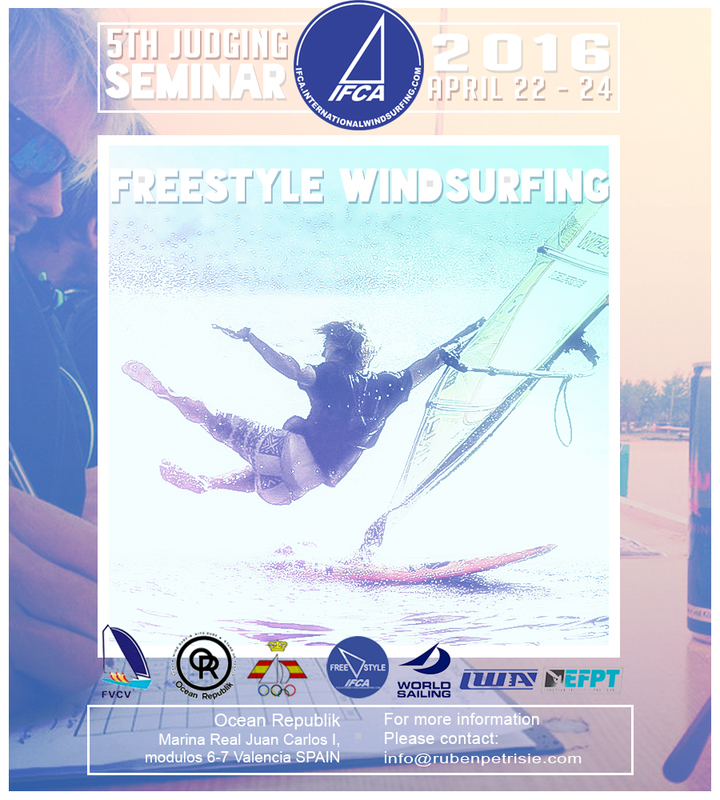 The goal is to set international standards of race management and freestyle windsurfing. This years Seminar will take place in Valencia Spain at the Ocean Republik Water Sports Academy from 22nd to the 24th of April. Brief history: This Seminar was organized by the president of the International Funboard Class Association to grant official certificates to a selection of IFCA certified judges. These judges get priority and are useful for events running underneath the IFCA such as: The European Freestyle Pro Tour and the IFCA Freestyle Championship events for youth, Junior and pro kids. Next to that is it also useful for local organisers to work with international certified judges who follow the same guide lines. Aspiring freestyle windsurfing judges learn almost everything from race management (race crew, event set-up, elimination system) and freestyle judging (rules, contest formats, moves, criteria), to organisation and structure of windsurf sport. A practical part is also included in the judging clinic. In the last day of the course, participants take an exam. Depending on the result of the exam, they get certified as national or international IFCA/EFPT freestyle judges and, therefore, will be able to set up a professional windsurfing competition anywhere in the world. 2nd TOUR STOP FOR FREESTYLE IN AUSTRIA.